This year’s show provided plenty of fuel for its critics, beginning with the Academy’s bizarre decision to make Seth MacFarlane the host. The director of Ted has been rightly criticized for his juvenile sense of humor, but I feel that I should point out that MacFarlane didn’t invent bad taste. 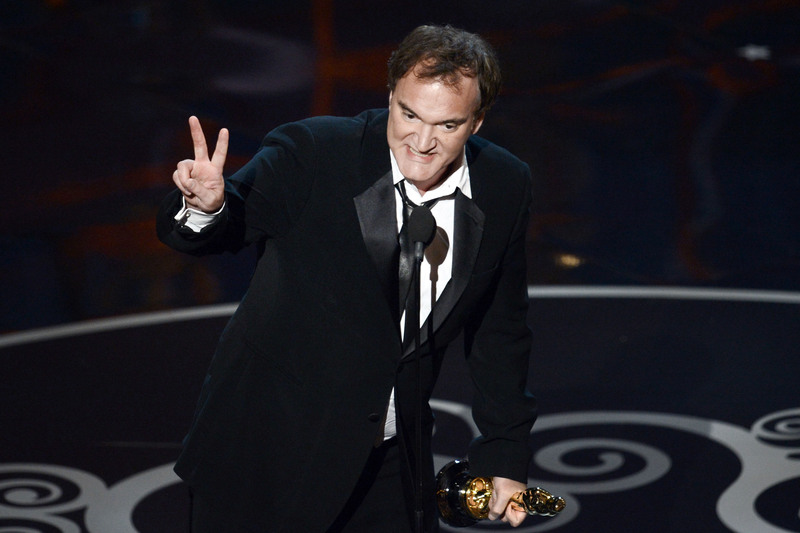 I remember the 1987 Oscars – excuse me, I mean the 59th Academy Awards. They showed a clip from Platoon, in which American soldiers are shown clearing out a Vietnamese village. This immediately segued into a musical number with Bernadette Peters. This was perhaps the most tasteless ting I have ever seen on television. This brings up a question: why even bother with musical numbers? Why not just hand out the awards? I guess because the awards are not so much about excellence as they are about hype. The movie industry must be to made to seem more important than it is, and the awards must be made to seem to have more meaning than they do. So the organizers of this year’s awards must have been so pleased with themselves when they persuaded Michelle Obama to announce the winner of the Best Picture award. A further step in the merger of Hollywood and the government, which began with the election of Ronald Reagan (Barack Obama’s hero) to the White House. And it was very fitting, too, considering that the picture that won it is an exercise in historical falsification that glorifies the C.I.A. Brill describes how “non-profit” hospitals rake in enormous profits, so much so that their top administrators can receive multi-million dollar salaries. Medicare, Medicaid, and private insurers use their influence to try to keep costs down, but their efforts don’t apply to the millions of Americans who don’t have coverage. What we’re seeing is a sophisticated form of bottom-feeding: hospitals are gouging the most vulnerable members of our society. Brill is also critical of the pharmaceutical industry. He demolishes their claims that research and development justify the high prices they charge. Brill gives a spirited defense of Medicare. He shows that it is actually run in an efficient manner. (Hospitals are reimbursed more quickly by Medicare than they are by private insurers.) He is, on the other hand, critical of Obamacare. Among other things, he points out that it will likely lead to higher insurance premiums. Brill suggests expanding Medicare so that it applies to everyone. This strikes me as the most rational solution to our health care problems. 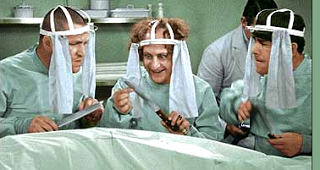 This article on Obamacare by Doug Henwood is also worth reading. 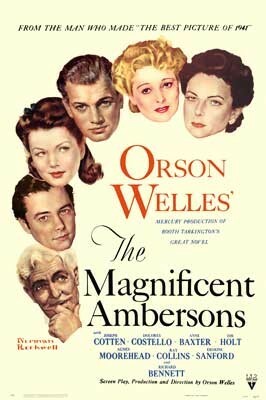 The Magnificent Ambersons was Orson Welles’s second film. It is based on the novel by Booth Tarkington. RKO Radio Pictures drastically edited it, and, over Welles’s protests, they tacked on an unconvincing “happy” ending. Even in its mangled form, however, this film is fascinating to watch. The story begins in a Midwestern town in the late nineteenth century. The Ambersons are a wealthy family whose mansion dominates the town. Isabel Amberson (Dolores Costello) marries Wilbur Minafer (Donald Dillaway). 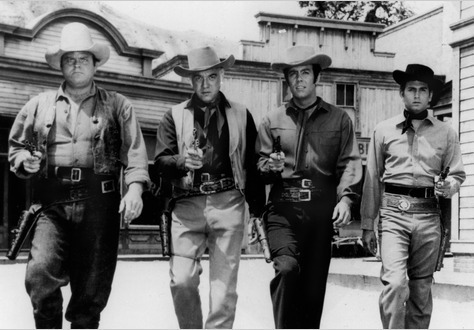 Their son, George (Tim Holt), is the heir to the Amberson fortune. Isabel’s former suitor, Eugene Morgan (Joseph Cotten) shows up at a party one day. After Wilbur dies, Isabel and Eugene begin to strike up their former romance again. At the same time George becomes infatuated with Eugene’s daughter, Lucy (Anne Baxter). When George learns of his mother’s affair with Eugene, he is adamantly opposed to it. While the Ambersons lose their money through bad investments, Eugene’s automobile company prospers. Welles’s film is an exercise in nostalgia. It presents a vision of an America that was more elegant and humane before the rise of the automobile. This is, of course, based on a highly selective view of the past. There were a lot more people working twelve-hour days in factories than there were living in stately mansions. Welles was no doubt aware of this. He apparently saw the belief in an idealized past as expressing a human desire for goodness. Also, he does not portray the Ambersons as perfect. George is essentially a spoiled brat. It’s not until when the Ambersons lose their fortune that he begins to show a sense of responsibility and consideration towards others. The Magnificent Ambersons was a labor of love for Welles. He put considerable effort into making it. For example, he filmed the winter scenes in an ice house near downtown Los Angeles, so the actors’ breaths could be seen. He was reportedly deeply bitter at the studio’s drastic editing of the film. These cuts are perhaps the reason why the second half of the movie feels a bit rushed. The Ambersons seeem to lose their money all at once. Still, The Magnificent Ambersons is a remarkable achievement. 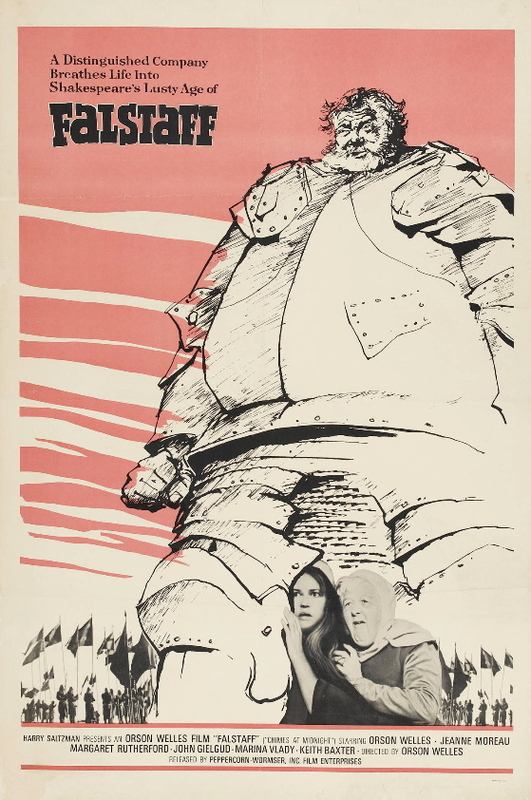 Orson Welles’s 1965 film, Chimes at Midnight, combines scenes and dialogue from five different Shakespeare plays to tell the story of Sir John Falstaff. This film was the result of a life-long fascination that Welles had with Shakespeare’s historical plays. Welles regarded Falstaff as a tragic figure, so it is not surprising that this film is more of a tragedy than a comedy. Chimes at Midnight was a labor of love for Welles, so it is sad to note that he had difficulty getting funding for it. Welles had to work with a limited budget. One result of this is that the sound quality is poor. I often had difficulty making out what the actors were saying. (This is not a good film for someone who is unfamiliar with Shakespeare.) Despite such problems, though, this film is a remarkable achievement. The scene in which Harry (Keith Baxter), the newly crowned Henry V, coldly rejects his old friend, Falstaff, is disturbing to watch. It is, in a way, a comment on the corrupting effect of power, which can sever emotional ties between people. 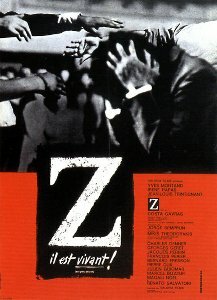 Overall, this film expresses a cynical view of political power. Henry IV (John Gielgud) comes across as a pompous hypocrite; he talks about honor and duty, when we know that he murdered his predecessor, Richard II. (He is so vain that he demands that his crown be placed on the pillow next to him on his deathbed.) Harry inherits his father’s hypocrisy along with his crown. Chimes at Midnight is also notable for its depiction of the Battle of Shrewsbury. The scene begins with knights charging at each other on horseback, and it ends with soldiers grappling with one another in the mud. It is a visual metaphor for the dehumanizing effect of war. Chimes at Midnight is one of Welle’s best films. 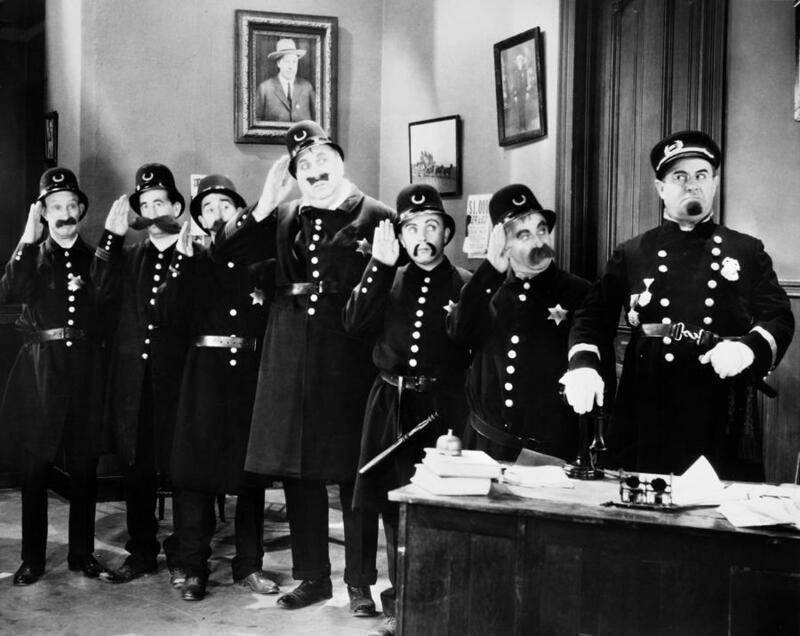 Unfortunately, due to legal disputes over the film’s ownership, it has often been out of circulation. You can currently find it on YouTube. I recommend checking it out before it gets pulled. I unfortunately missed Bullhead when it was first released in this country. This Belgian film was nominated for an Academy Award for best foreign language film. (It lost out to the Iranian film, A Separation, which is also very good.) First time director Michaël R. Roskam has crafted a powerful and disturbing movie. Jacky Vanmarsenille (Matthias Schoenaerts) belongs to a cattle-raising family in Flanders. His family uses hormones to fatten their cattle, which is illegal in Belgium. Jacky uses steroids to bulk himself up, in a manner eerily similar to the way he bulks up cattle. Through a series of flashbacks we learn that Jacky’s behavior is the result of a traumatic childhood experience. Jacky’s family becomes increasingly involved in the trade in illegal hormones. When a leader of the “hormone mafia” has a government agent killed, Jacky begins to fear that his family may be in over their heads. At the same time Jacky obsesses over a girl from his childhood. 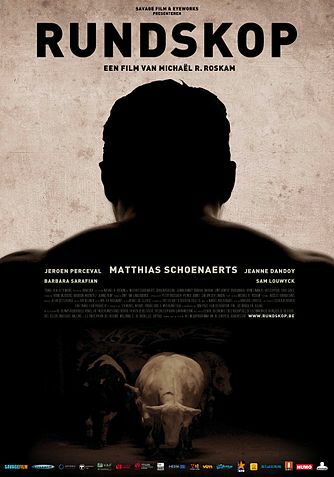 Bullhead derives much of its power from Schoenaerts’s performance. One can sense the frustration and rage boiling inside his character. Much of the suspense of the film comes from knowing that his anger can explode at any time. This film depicts Belgium’s hormone mafia. This group presents a real problem in that country. In 1995, they murdered a government meat inspector (this incident was the inspiration for this film). It appears that farmers are willing to break the law just to give themselves a competitive advantage. The logic of capitalism fuels such behavior. Here in the U.S., where agribusiness practically controls the government, there are no prohibitions on hormone use. The U.S. has been pressuring European countries such as Belgium to lift their bans on hormone use. It seems that the U.S. has become a sort of hormone mafia. The fortress that is the Los Angeles Police Department. The police across Southern California were on high alert in a dragnet that appeared to stun even a part of the country familiar with dramatic police hunts. Teams of police officers were dispatched overnight to guard uniformed officers and their families, tactical officers set up lines of defense outside the fortress that is the Los Angeles Police Department, and motorcycle officers were ordered to retreat to the safety of patrol cars. In Torrance, two women delivering newspapers were shot and wounded by police officers who mistook the vehicle they were driving for the one identified as belonging to the gunman. You think so, huh? And is it a tragedy because it was a case of mistaken identity, or is it a tragedy that they only believe this was a case of mistaken identity? I suppose we shouldn’t be too outraged by this. After all, we have a president who draws up a weekly kill list and orders drone attacks without much concern for the legal or moral consequences. The LAPD are clearly in step with the twenty-first century. I have to admit that I’ve never been terribly keen on Westerns. I find most of them impossible to believe; they’re simply not accurate depictions of the “Old West”. They get all sorts of details wrong, beginning with women wearing twentieth-century hairstyles. And they show cavalrymen shooting guns while riding their horses. In real-life, they had to dismount before firing, otherwise the horses would panic. And of course, there’s that whole business of the good guy and the bad guy facing each other in the middle of the street in a shoot-out. (Of course, the good guy always happens to have faster reflexes than the bad guy does.) In reality, gun battles were usually fought the same way they’re fought today: people hiding behind things and shooting at each other. The Cartwright family, moments before they were gunned down in the middle of the street. George Stevens’s Shane is one of the better Westerns that I’ve seen. A retired gunslinger, Shane (Alan Ladd), who is fleeing his past, passes through the land of a homesteader, Starrett (Van Heflin). There he learns that a wealthy landowner named Ryker (Emile Meyer) is trying to force Starrett and other homesteaders off their land. Shane spends the night with Starrett and his wife, Marian (Jean Arthur), and his son, Joey (Brandon deWilde). He decides to work as a farmhand for Starrett. Meanwhile, Ryker hires a gunslinger named Walker (the wonderfully creepy Jack Palance) to help him intimidate the homesteaders. The rest of the film basically builds towards the inevitable confrontation between Shane and Walker. Shane is entertaining to watch. The characters are complex, and the cinematography is beautiful. Still, while I was watching this movie, I couldn’t help feeling that it could have been better. It hints at a love triangle between Shane, Marian, and Starrett; but this idea is never developed. At the same time the film puts far too much emphasis on the business of Shane forging an emotional bond with Joey. At times this is almost embarrassing to watch. And I thought they could have done more with Palance’s character. (Palance’s mere presence in a film automatically makes it better.) Still, I can see why this film is considered a classic. If you want to see a good Western, you can’t do much better than Shane.